They should do that: Tivoli NetWorks: Radios with Wi-Fi, maybe AirTunes? 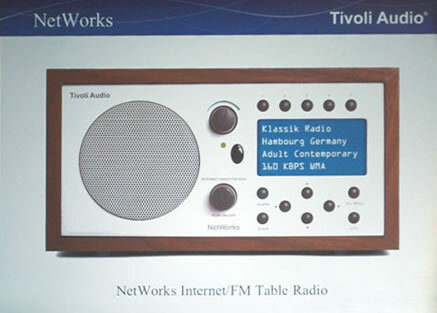 Tivoli NetWorks: Radios with Wi-Fi, maybe AirTunes? Since my very first entry here, I've been waiting for someone, anyone to come out with a compact high quality speaker system that works with AirTunes. Today Gizmodo broke the story of NetWorks and NetWorksGo, two new radios from Tivoli Audio with built-in Wi-Fi. It seems these devices will definitely be able to stream internet radio over a wireless network. But I'm really hoping that these devices will work with AirTunes. That will enable all us iTunes users to seamlessly play our music on the device without installing any additional software. Of course one limitation of using AirTunes might be that pausing or skipping tracks from the device might not be possible. However, that's probably an acceptable limitation for most people. I'd also love to see a device like this based on the iYiYi, that would just be the best of everything.